It is very much welcome that an out of hours information and advice service for County Kildare is now available, operated by the Peter McVerry Trust on behalf of Kildare County Council. Due to a housing crisis we need to offer more help to people who find themselves without a place to stay. This out of hour’s advice service, operated by the experienced Peter McVerry Trust is a welcomed addition to the support services available to homeless people in Kildare. I have recently met with Pat Doyle, Managing Director of the Peter McVerry Trust who explained to me the services and support the Trust offer. I have full confidence that this partnership will be a success and be of some support to homeless individuals in Kildare. 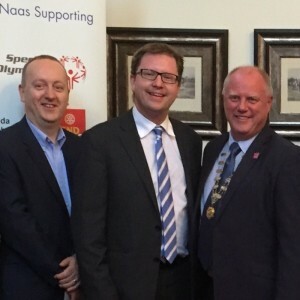 I also want to commend the assistance, effort and fundraising that went into this project from the Naas Rotary Club. 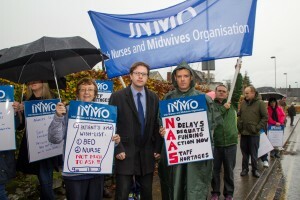 At Naas General with staff protesting the dire shortage of staffing resources a few months ago. The lack of commitment toward health care in Kildare by the current government has to be criticised. Since it was revealed at the start of June that Portlaoise Hospital is to have its A&E services downgraded, this will place further pressures on Naas Hospital emergency department which is already under strain. Minister Varadkar stated this week there would be a ‘modest increase’ in operating budgets to allow ‘existing levels of service to be maintained’. Given the expected increase in demand to Naas A&E which will arise from the downgrading of Portlaoise Hospital it is clear there is no cohesive plan in place toward health care in Kildare and current services being maintained will not be adequate to cope with rising numbers. After the storm comes the sun. 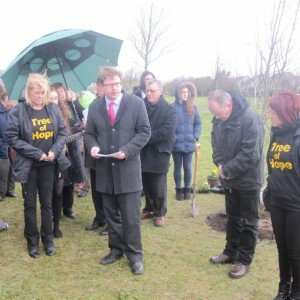 The heavens opened in Monread Park today but the spirits were not dampened as we planted and dedicated the Tree of Hope for all victims of suicide and as a place for their loved ones to remember them. Well done to Maud Nolan for all her work on this and to the council parks department for providing the materials and doing such a good job with a tree and bench now providing this quiet corner of reflection. Thanks to the Deputy Mayor, Cllr. Frank O’Rourke, for officiating at the event. Our local Government TDs must step up to the plate and tackle the growing problem at Naas General Hospital. The latest figures from the Irish Nurses and Midwives Organisation, published this morning (Jan 6th, 2015), reveal there are more than 600 people on trolleys in hospital A&Es, the highest number recorded since “TrolleyWatch” began ten years ago, and 32 of those are in Naas General Hospital right now.